"Joseph Volpe, 74, worked his way up from apprentice carpenter to general manager of New York’s Metropolitan Opera, a position he held for a headline-making 16 years. Upon his retirement in 2006, The New York Times called him a 'famously demanding impresario.' 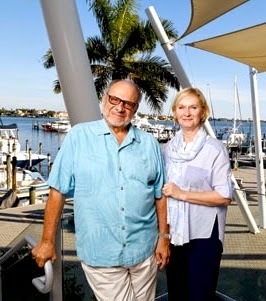 Volpe and his wife, Jean, a ballet teacher and former principal soloist with the Metropolitan Opera Ballet, will winter on Longboat Key while he continues his work as a theater consultant, including helping plan a new opera house in Athens, Greece. 'He’ll never unwind,' says Jean. 'He’s always finding something to do.' [Source] The article also details the new boat he purchased; how he chose Florida as his winter destination; the couple's exercise routine; what arts organizations will be the recipient of their presence; and if he has any regrets about the Metropolitan Opera.